A diverse group of celebrities, activists, and artists open up about what feminism means to them, with the goal of helping readers come to their own personal understanding of the word. 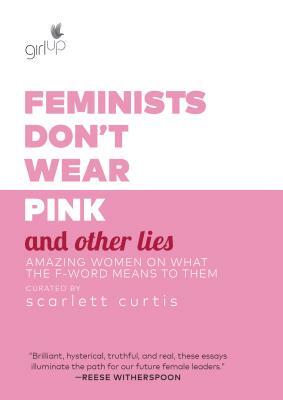 Feminists Don’t Wear Pink and Other Lies is a collection of writing from extraordinary women, from Hollywood actresses to teenage activists, each telling the story of her personal relationship with feminism. Often funny, sometimes surprising, and always inspiring, this book aims to bridge the gap between the feminist hashtag and the scholarly text by giving women the space to explain how they actually feel about feminism. Writer, journalist, and blogger Scarlett Curtis is the New York contributing editor at Elle magazine and has had work published in The Guardian, The Telegraph, The Times, and Vogue. In February 2017 she began writing a weekly column for The Sunday Times Style titled The Generation Z Hit List. A passionate activist, she has also served as the social media director of the UN’s campaign The Global Goals and currently works with the Un-Idle Collective, an online and offline activism collective for young women.